What an amazing weekend. So many awesome people, such fantastic weather. Such fabulous yarn and fiber. Loved it. Wish I’d been able to go this year. 🙁 Maybe next year we’ll be in a better financial condition . . . Thanks a million for this beautiful impression of Rhinebeck. Beeing in Europe I’ve only heard about it, but you both really catched the spirit on your pictures! I am though, left with a few questions…. What was destined to leave in the box you were carrying 😉 ? And : It really struck my how much your husband must love you. Your featured beautifully as Alice in Wonderland in his photographes… it really, really shows! Glad you had a good time!!!!!!!!!!!!!!!!! I will pretend that there are not unflattering pictures of me in there 😉 then again, I’m also pretending that there is such a thing as a flattering picture of me. Glorious pics – I would even say that qualifies as your blogstalking post! You look so happy and so beautiful! So Beautiful! You’ve got a great man! I could only dream of having mine come to an event like this with me! And to enjoy it?!?! WOW! 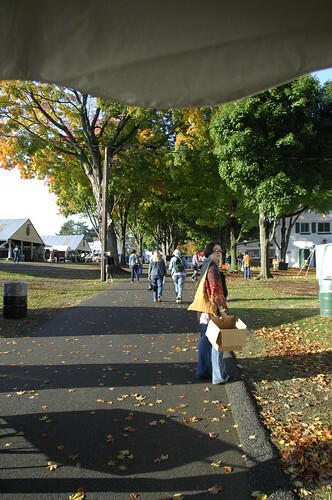 Three images stay with me: Deep Fried Pickles!, Fall leaves upstate and adorable Pam and her Charlotte’s web shawl. The pic with the drop spindles was pretty cool too. Great bunch of photos! I didn’t realize who you were at the hotel. I knew your face but I couldn’t place the name. Sorry. The photos are great – except maybe for that first one of me with my prominent double chin that I am in denial about :-0 The Kid and I miss you already! Great piccies, of course. The Man needs to be given mad props as usual. I saw you! Your crocheted shawl was a traffic stopper. I also love your laugh.